For the third straight preseason, the University of San Diego Toreros were picked to finish first in the Pioneer Football League by the league's head coaches, but with uncertainty at multiple positions due to losing 24 seniors, head coach Dale Lindsey isn't buying into any preseason hype. "We're very appreciative of all the first-place votes. We don't know how we got them," Lindsey said during Thursday's PFL coaches preseason teleconference. "We'd like to thank all the coaches for their kindness, but we don't know that we're a first-place team." "There's just too many questions at this time." With three-year starter Mason Mills moving on after becoming USD's all-time leading passer, some of the biggest questions will involve the quarterback position. The top contenders for the starting job are sophomore Keith Williams and redshirt junior Trey Wheeler. Williams played in six games as a true freshman last season, while Wheeler had to sit out after transferring from the University of Simon Fraser. Williams and Wheeler will be joined by four incoming freshmen, including Grossmont High product Anthony Lawrence. "We don't feel at this time we have a true starter," said Lindsey. "With limited PFL experience, they're going to have to grow into the role." "We're hoping that Keith and Trey can do the job for us, but we'll have to see." Whoever gets the nod will have a quality group of passing targets to choose from. Senior receivers Reggie Bell, Brandon White, and D'Angelo Barksdale will be back to help lead the offense. There will be inexperience at tight end and fullback, but they'll be protected by an offensive line with four junior starters returning. The Toreros will also lose two top rushers in Kenn James and Joe Ferguson, but the run game should remain in great shape with the addition of Jonah Hodges, a transfer from the University of California, and the return of redshirt junior Dallas Kessman. After a breakout year in 2012, Kessman was forced to miss 2013 after suffering a foot injury during the season opener. If healthy he'll most likely share carries with Hodges, who looked impressive during spring practices. The secondary should see some improvement this season, but there will be a huge hole in the front seven with defensive tackle Brandon Pulealii being the only returning starter. Gone are All-PFL defensive ends Blake Oliaro and Steve Garguilo. "We have a lot of kids on the defensive line that have some playing experience, but they're not true starters," said Lindsey. "We have some depth, but I don't know at this point that I would say that we have the quality front line guys on defense that we had last year." Due to Zach Devaney and Michael Ruffino graduating, and senior Troy McClelland moving to safety, all linebacker positions will feature new starters. Competing for one of those spots will be redshirt freshman Alec Moreno. The former Poway High standout transferred to USD after sitting out the 2013 season at the University of Nevada. "We got to get out here and we got to coach," Lindsey added. "When you lose 24 seniors, you got to do some work, and that's on the coaches this year." 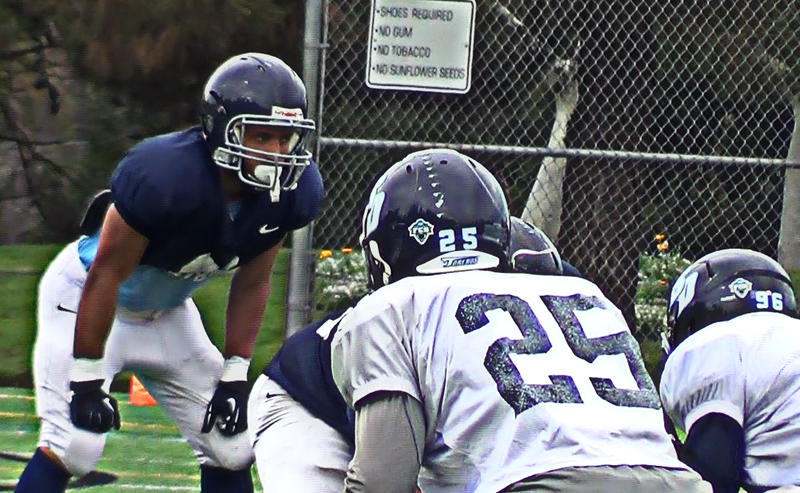 The Toreros, coming off an 8-3 campaign, begins fall camp on Wednesday, August 13th. They host Western New Mexico in the 2014 season opener on Saturday, September 6th.